Mercury International was the (I’m fairly certain) imaginary company for whom I “consulted” to fulfill the requirements for my MBA capstone course. In January, I teamed with four other classmates to work as a group with the intention of helping Mercury International increase revenue and market share. I wrote about (and posted) the capstone here. Mercury was a specialty athletic apparel company. 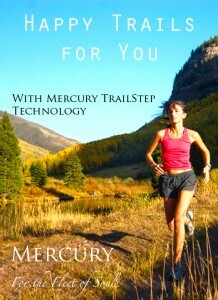 The backstory was that a brother and sister had founded the company twenty years ago to bring to market the TrailStep, a specialty athletic shoe designed to handle “extreme” conditions like one might encounter on a nature trail, say, in the mountains of Colorado (Mercury’s home state). 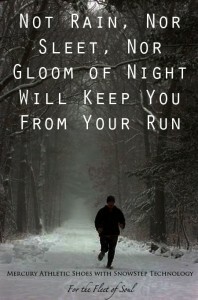 Later, it produced the SnowStep (for cold-weather conditions), and then SweatLess, which was apparel with those perspiration-wicking technologies that have become so popular. You’ll notice here that there’s a lot of specialty, but nothing with broad appeal. My first thought was: “I’m a personal trainer and work out regular, but I have no need whatsoever for a trail shoe.” Though, admittedly, the SnowStep sounded useful for winters. So our first strategy was to introduce the Mercury Wing. There were a few names brought up, but I suggested the Wing because I liked the reference to the winged talaria worn by Mercury, the god of commerce and trade. Who was known for being mercurial, traveling so quickly as he did from place to place. He was impossible to pin down. He was, as they say, fleet of foot. Which inspired the copy I suggested: “For the Fleet of Soul.” I liked it because I thought it captured both a quickness and a feeling of youth and enthusiasm. Those who are fleet of, say, heart or foot or mind are not just quick; there is an element of clever, as well as playfulness, I’ve always thought. So that became the company’s tagline. For the Forbes mock-up I did, I created some mock ads, as well. 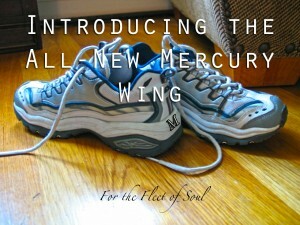 The first to introduce the Mercury Wing, and others to highlight already established brands. Copy: For the Fleet of Soul. Pitch: Mercury International gained success as a specialty athletic apparel company targeting niche customers. By introducing a mass-market product with broad appeal to the casual athlete, Mercury can retain its core customers while increasing market share and revenue.